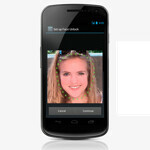 The new Face Unlock feature for Ice Cream Sandwich is one of the more intriguing features that will be available, we don't know a lot about how it exactly is going to work. Obviously, it would have helped if the demo at the Galaxy Nexus announcement had actually worked, but since we don't have that, we have to just guess. The Cyanogen lead developer Koush tweeted that it seemed like it would be easy enough to game the system by using a photograph to hack into someone's phone. It's a valid worry, but also one that shows a pretty small amount of faith in the Google engineers. That fear has been put to rest by Android-focused Developer Advocate Tim Bray, who has said that a photo will not be enough to unlock your phone. Now, the big question is in how long Face Unlock will take to get you into your phone. Face Unlock sounds great, and Google is known for pushing its products to be fast, but Face Unlock needs to be very fast to keep users content. Do I have to smile? What if I'm just an angry person? Google has being woking on this for quite some time ,how old is the Nokia feature ? I like to see real world usage rather than controlled demos anyway. Yet...iphonearena already posted a "review" of ICS. Now we are forced to read about your "guess" as to how it operates. Surely you have hands on experience, right? No one with a shred of ethics would "review" an OS they had never used...would they? Can't "review" an event you did not attend either ( how is parking in Hong Kong, Michael? )...but no one would ever be so small minded as to attempt that...right? We actually haven't posted any "review" of ICS. We have only posted previews of features to expect. I'd say a full video feed of an event gives enough to review. It seems you would agree since you've found enough about me to judge without having met me or had a conversation with me. I have no intention of starting a fight, but I will certainly defend myself and this website from anyone slinging mud unjustly (and hypocritically in this case). Does the Nexus have an IR sensor? Do ANY phones have this? If not, what's to stop a photo from working? Taking in ambient light and judging if the face is receiving the correct "shine" on their forehead? Does it require you move your mouth or eyes for validation? Could I just take a blown up photo of the person, cut out a hole for the mouth and eyes, then smile a cheesy grin and have access into my bud's Nexus? Proximity sensor is IR based, isn't it? Could the range on that help with Face Unlock? What about a 3D picture/video. You would need 2 lenses to read that it is indeed 3D. So 2 phones out of all Androids would be able to do this (not Nexus). Side note, say you have 2 EVO 3Ds...play a 3D video on device A, record 3D video on device B of the 3D playback on device A...Will the video look 3D on device B? What about a life-cast of the face? what if we just chopped the head off and wiggled the mouth infront of the camera?